If Swarthmore enjoys name recognition in Japan, it may be as the only American college with a Shogi Club. A Japanese variant of Western chess, shogi shares with chess a common origin in the ancient Indian game of chaturanga. 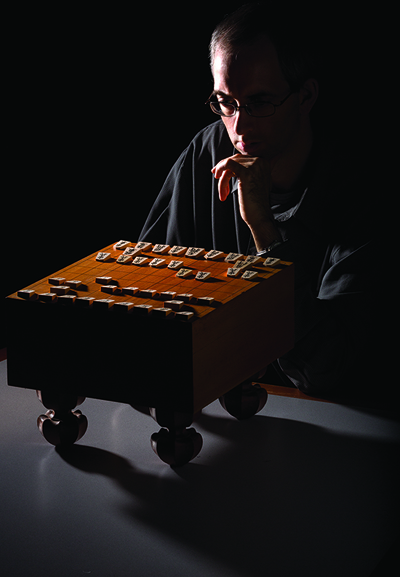 Associate Professor of Philosophy Alan Baker, a logician and chess aficionado, founded the club in 2004. His group of around 15 students meets on Thursday afternoons for several hours of casual play. Baker first discovered shogi on a trip to Japan in 1996. Finding himself on a 36-hour ferry ride bound for the island of Kyushu, a portable shogi set helped pass the time “much to the amusement of fellow passengers,” he admits. By the late 1990s, shogi forums popped up on the Internet, and Baker began to partake in what he calls the “tight-knit and small” shogi community outside of Japan. Cambridge and Cincinnati have welcomed Baker to their small hotbeds of shogi competition; Cambridge, of course, because of the university and Cincinnati, ironically, thanks to the Midwest’s chess circuit. As three-time U.S. representative to the World Shogi Forum and winner of the 2008 U.S. Shogi Championship, Baker has proven an excellent agent for bringing a shogi-styled community to Swarthmore. Many shogi players at Swarthmore, including Baker, don’t speak Japanese. But they insist that board pieces, each inscribed with a black Japanese character, aren’t nearly as intimidating as they look. When asked to compare shogi to chess, Baker calls shogi “more dynamic” because there’s “less of a role for memorizing opening sequences.” Shogi allows for captured pieces to “drop” back in play atop empty squares. Pieces literally switch alliances to bolster the opposing player’s arsenal. Frank Mondelli ’14, who’s practiced shogi sporadically for the last two years since meeting Baker at the fall activities fair, observes, “This one rule changes the aesthetic and feel of the game.” Harris admits the drop rule creates “more of a headache than chess,” as Adrian Wan ’15 laughs and adds, “It’s a whole other dimension … shogi every time!” Wan first read of shogi in a popular Anime series, prompting him to purchase a game set in Japan and practice with his dad. With a Sunday morning television show, national stars, and more than 20 million players, shogi enjoys more prominence in Japan than chess does in the United States. 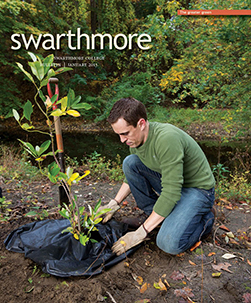 Baker is trying to bring some of that renown to Swarthmore. In April 2011, Swarthmore hosted the U.S. Shogi Championships. This December, five Japanese professionals visited campus, including Asuka Ito, Swarthmore’s returning club patron. The visit provided a chance to integrate with Swarthmore’s Japanese program, since none of the traveling Japanese players speak English. In anticipation, this fall the Japanese Department began alerting new and native speakers to Baker’s practice sessions. Mondelli concedes he’s still very much a beginner but muses that he’d like to become one of those “people who start playing shogi and then spend much of their life immersed in it and as a result become very strong very fast.” As a quirky intersection between chess, strategy, competition, and Japanese language, the Swarthmore Shogi Club may be the beginning of that immersion for curious students.